These past few weeks have seemed as though a tornado has swept through my life. We all have those moments. Sickness, deadlines, unexpected interruptions. During these times, the only things that get done, are those few things that demand the most attention – kids who need to be fed and clothed, husband who needs to be loved, work deadlines – enough said. Knitting and blogging had to wait. But, when you think about it, this is a little bit how advocacy works. The government is dealing with a bit of financial tornado right now – things like sequestration, the budget re-authorization and the debt ceiling. All buzzwords that we may not understand, but realize that they certainly aren’t “feel-good” things. So, during these times, its the things that demand the most attention that will get recognized. That’s you and I.
I recently had the privilege to attend an advocate training summit for the National Patient Advocacy Foundation (NPAF). We learned about the NPAF priorities, and how to advocate for these issues at the state level. Of particular interest was state implementation of aspects of the Affordable Care Act, also known as Health Care Reform. If this is an issue that is important to you, I would suggest visiting their website for more information. The format of this meeting allowed for excellent advocate interaction and discussion. One of the topics that I was charged with leading was about the identification of advocacy priorities. As we were talking, I doodled a picture on a piece of scratch paper which ended up becoming a big hit. Bare with me, as this idea is a work in progress, but I wanted to share it with you. It’s a funnel in it’s own right, just a bit more practical than a tornado. 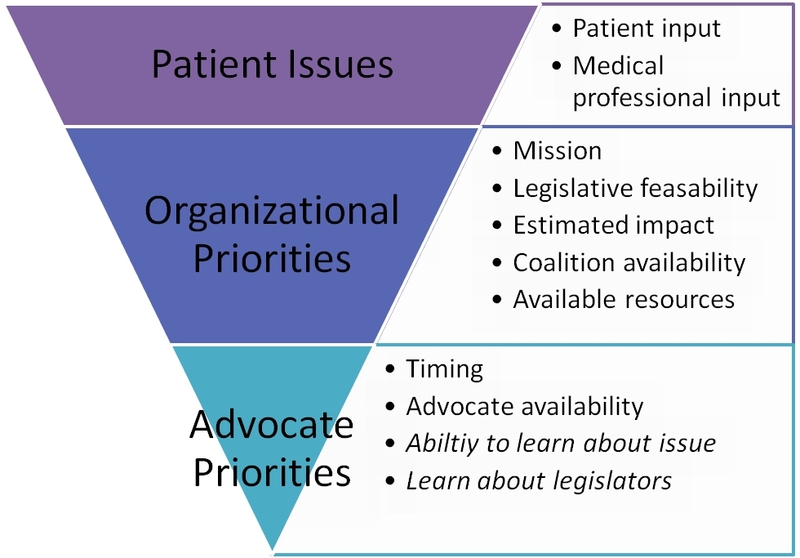 At the top we start with the Patient Issues. If you think about CHD, there are hundreds, if not thousands, of things we could list off that we could improve in the lives of those living with CHD and those to be born with a heart defect. An advocacy organization gathers the issues of concern from many sources including what patients and medical professionals tell them are problems. Then, the issues are filtered down to develop Organizational Priorities. First and foremost, groups assess whether the issue raised fits with-in the organizational mission. They look at legislative feasibility, or whether this issue can effectively be addressed through the legislative process. They also assess the impact of the issue in comparison with other pressing concerns. They look at who potential partners could be and opportunities for coalition building, whether we need to champion the issue or if someone else can take the lead. And finally, resources are considered – how much time, effort and money will it take to reach out goal. A given organization may end up with anywhere from a handful to several dozen priorities. Many of these priorities can be addressed by working directly with legislators, federal agencies or strategic partners. However, there are definitely cases where advocate involvement is essential to the success of the efforts. These issues are considered advocate priorities. They are selected based on timing and the current state of governmental affairs, as well as availability of advocates and the nature of their personal story. The advocate priorities may seem limited in number, but this is a good thing. It is a lot of work for an advocate to learn about an issue. It is important for the advocate to have knowledge of the legislator’s position on the issue, as well. The volunteer time and energy of advocates are valuable and should be maximized on a few pointed issues.